I’ll be the first to admit that I’ve purchased toys that our cats simply don’t care an iota about. Only after the toy is home, and our cats appear confused and bored by it, do I realize that I purchased the toy simply because I liked it. Geeze, those cat toy companies are clever with their marketing. My bank account is proud to know that I didn’t buy one that day, but I couldn’t get it out of my head. The more I thought about it, the more I was convinced that our cats would like it. Well, by the time I decided to actually purchase one, they were all sold out. That’s when I had the idea to make my own version. While it would be easy enough to sew a dozen in an afternoon, I wanted to try crocheting one; I thought a crocheted version may be a bit more durable. Plus, I’ve been in a crocheting mood lately, so it worked out nicely. A few hours later, we had our homemade toy crocheted, stuffed with polyester batting and catnip, and ready for action. While it took the cats a little while to realize what it was for, once they figured it out, they seemed very satisfied. Since I’ve made our homemade version, CG and Ellie have used it a number of times. Out of the blue I’ve seen them go up to it and just play with it wildly, and I’m so glad that they can do that. There’s nothing better than providing your cat with the toys and tools they want and need to act like a cat. While they like to play with it on their own, it can also be a great toy to use during playtime. By just running it across the floor, the cats will usually lunge and bat at it. So there’s our homemade toy! Have you ever made a homemade toys for your cats? Which have been the most popular? Please share in the comments! Loved your article. If the toy is “free” then they will play with it but if you buy it then it is ignored. I too crochet and have made balls and small stuffed animals for our cats over the years which they loved. But the best toy ever was a long shoe lace with a homemade tassle attached to one end. We called it the “sacred string”. It was the favorite thing of all times being fought over by our crew and dragged everywhere by one cat in particular. He even slept with it. I made a few others but those were ignored- it was just this one particular shoe lace that was in demand. It’s so funny how they become attached to certain (usually random) things. How cute! Do you crochet a flat rectangle and then stitch up one side? Do you think catnip is essential to getting the cats to play with it? Dotty doesn’t respond to catnip at all–I even tried buying a plant a few days ago–nope, no reaction. 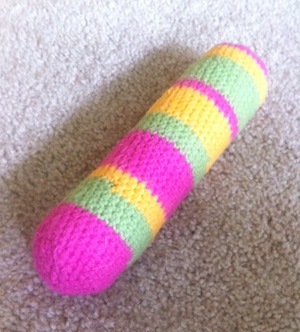 I don’t want to spend a bunch of time making this thing and then have it end up in the box of unused cat toys. Although I do like to crochet, it might be nice to try. I’m not sure what to stuff it with. ARGHH–I don’t know where my creativity has gone! I don’t want to have to go to the fabric or craft store to make this. I just gave a bunch of yarn to the thrift store recently because it was taking up so much space. No, but good question. Actually, I crochet in a circle, and then when it’s the diameter I want, I just start crocheting around the outer most row to form a tube. I’m not an expert, so I don’t believe those are the proper terms, but I hope that makes sense! 🙂 I don’t think catnip is necessary at all. I figure if you like to crochet, it may be fun. I used the “Sugar and Cream” yarn – it’s usually rather cheap, plus when crocheted tightly, it’s a bit stiff, but I think it will last longer that way. 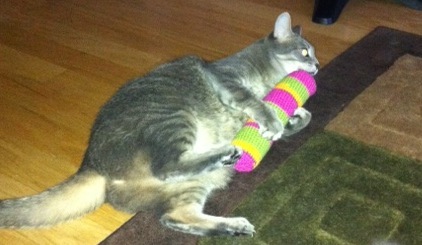 I stuff tube socks with batting & catnip and just tie a knot at the end. Not as pretty as yours but works the same way. Thanks! Carolyn, I think I’ll try your version for now. If she likes it, I’ll go buy some yarn and crochet one. Monika, I like the shoelace with the tassel too. I agree, the “free” toys get played with a lot more than the bought ones. Dotty loves ponytail holders. She carries them all over the house, and if I toss them to her she goes nuts and flings them across the room. I just made one by taking a long skinny sock that I’ve never worn and stuffing it with several other socks that I never wear! Now we’ll see if Dotty plays with it. If she does, I’ll crochet one (but I’ll bet she’ll prefer the sock). Right now our 8 week old CH kitten (Molly) loves to play with anything and everything but especially the inner ring from the top of a soda bottle. Here we have to pull them off for recycling so there are quite a few. Attach a string, yarn or shoe lace and watch them go after it. Molly loves to lay on her back while I dangle it above her. I have it just a little bit above her reach so that she has to stretch to get it. I think that that will help her build up her muscles. I believe she has moderate CH but still not totally sure ( watched the videos you provided Amanda ) as she was very underweight and small for her age. She’s playing with it!!! At first, she just sniffed it and looked at it funny and walked away, but now she keeps coming back and attacking it. Yay! Yes, Amanda, I was thinking about crocheting in a circle just like you’re describing and thinking, hmm… that would probably work better. I’ll see how much she likes this sock kickeroo and then I’ll go pick up some of that yarn–I practiced a few rows with some boring off-white stuff I’ve got here, but I still remember how–I’m a knitter, or was–I got rid of all of my yarn! It sounds like fun though. I’ve been spending this whole summer gardening, and I need a project to do indoors. She’s off in the other room now, but I’ll bet she’ll be back again in in a minute to attack this thing again. She likes the knot I tied in it. If I crochet one, I’ll have to add a big fat tassel onto the end. Martha and our other cats like simple toys that I occasionally crochet for them. Hi again Amanda – Didn’t really want to ask a question in these posts but since there wasn’t any other field listed that I could ask it in, here goes. The CH kitten we rescued has kitten lice and the vet recommended using a pyrethrin shampoo. However after my husband bought the shampoo and after reading the label it states do not use on kittens under 12 weeks old I refused to try it. I therefore went on-line to find a suitable product. As far as I have been able to determine there really isn’t anything out there that is safe for kittens. So I researched and found several websites that stated use a mild dishwashing soap, OK – what constitutes a “mild” dishwashing detergent? Dawn, Palmolive etc? If you read the ingredients and then check them out you do not want to use any of them on a kitten. Then another site stated use Baby Shampoo. Well with the recent findings that it has cancer- causing ingredients I sure do not want to use that. Other sites recommend using olive oil and then wash with a mild shampoo.. My question to you is : Have you or any of your readers had this problem? If anyone needed to give a kitten a bath what did they use? I watched vieos on YouTube but still didnt get any true answers. Thanks for your question! Please always feel free to contact me via email, too. It sounds like a mild dishwashing detergent or baby shampoo may be a good option, but before you try either, I’d suggest speaking to your vet to find out if either will do the job. I know you have some hesitations about both, but I’m sure a one-time bath (as opposed to using it daily/weekly for the rest of your life) won’t be too harmful. That said, perhaps you can find an all-natural shampoo or detergent at a health foods store (like Whole Foods) – their ingredients may be less intimidating. That said, you’ll want to check with your vet again to see if it’ll be effective. Good luck! And please let us know what you find out! Thanks! Hi Amanda, Thanks for your fast response. The vet is already on my agenda of calls to make on Monday especially as she told my husband to get the pyrethrin in the first place. I have a few questions for her. I also had thought of contacting a local Health Food store. I did find a mail order place in Canada for organic shampoo for cats but it costs $26.95 for 4 ozs. That’s a little steep for a 1 or 2x shampooing. Oh my , just went to your e-mail address page which I had not seen before. I enjoyed reading all of the comments and stories. Now I don’t feel all alone as I could relate to many of the comments etc. We currently have 6 other cats living in the house with us along with 7 semi-ferals in our garage. Molly is the first CHer and she is such a tiny kitten and after losing her brother I guess I’d rather be safe than sorry. Thanks for listening and ideas. :-} Will let you know what I find out.